Now it is time to get into some of the swag we were given at CES, and the first item is the Intercept Color Collection provided to us from Gunnar Optics.The Color Collection adds a handful of color to the stylish Intercept while providing the same lens benefits found in other models. The advantage in which Gunnar provides comfort from strain whether at work in front of a monitor or during long gaming sessions from the amber tint and anti glare coating. Someone that spends a lot of time in front of the screen, I am anxious to throw the Intercepts on and see how they do. The Intercept comes sporting the Ray Ban looking frames and when I am wearing them, the lenses do a great job first and foremost at eliminating glare. Whether looking at my monitor typing up this review or playing a first person shooter, I did feel like I was squinting less and it was slightly easier to see opponents in the shadows. On the show floor, I got the chance to try on different frames and lenses and of the various models that made an appearance, I preferred the Intercept because of the larger lense which provided a larger filtered field of view. While these have that retro feel to the design, they unfortunately did not share the same fit as they slightly pressed behind my ears making me have to take off in between rounds. As someone that requires corrective lenses at distances, they would have to be worn over glasses and that would just look silly, however, I would definitely suggest use to someone that wears contacts or does not need corrective lenses. 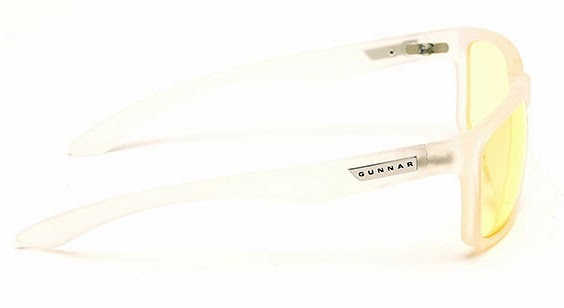 That being said, Gunnar is also able to provide their lineup with prescription lenses built for your needs. The Intercepts Colors are available now for $69.99 and available in five bright colors.